in Video No. 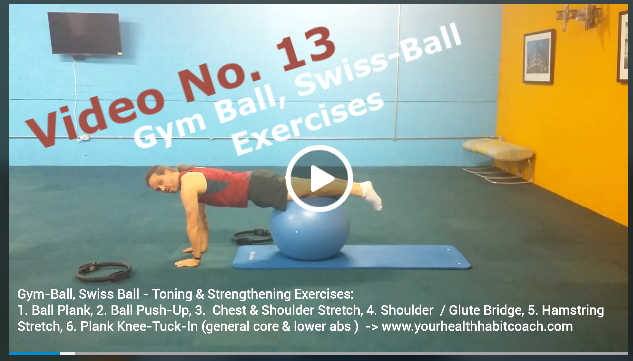 13 you are going to learn “Five Gym-Ball, Swiss-Ball Toning & Strengthening Exercises”, that focus mainly on Upper-Body Strength – chest, arms, core / abs / back and a bit lower body thighs and hips. All you need to get started is a bit of space, a gym/Pilates ball, maybe an exercises or Pilates/Stretching mat. These exercises could be done independently as a routine itself or as part of your gym or workout programme. a static Ball Plank (hips, legs or feet rest on the ball) – focuses on: chest, arms, shoulders, core, abs. Ball Shoulder-Bridge or Ball Glute-Bridge – focuses on: mid/lower back, core, glutes, hips, thighs. Plank Knee-Tuck-In – focuses on: Lower abs, lower core, upper body strength (arms, chest), shoulder stability. This is only a small selection of Gym-Ball or Pilates-Ball exercises to challenge body. The gym-ball is an excellent tool to increase core strength, upper-body strength and improve posture. It’s big advantage is that it doesn’t take up a lot of space and it’s portable/inflatable (it travels well). You can simple use it to sit on it at your desk (a great way to strengthen your core and work you postural muscles). Above shown exercises are some of the exercises and movements we regularly do in the corporate classes that I teach in the greater South Dublin, Dublin 18, Dublin 16 area (Sandyford Industrial Estate, Central Park, Leopardstown), e.g. during lunchtime or after-work classes. (1) Add some of these exercises to your general gym or workout routine. It’s always good to vary the type of exercises you do to challenge your body in different and new ways. Aim to do at least two of these exercise e.g. the static Ball-Plank and the Ball-Shoulder / Ball-Glute Bridge (those are some of the slightly easier exercises to start off with). (2) Do three set of each exercise and hold each position for 15-20 seconds. Increase the duration gradually by 5-10 seconds very second week. (1) to keep an exercises and activity diary, this will allow you to recognize progress and takes the guess work out of how many sets, reps you did and what weight you have used. You can get a A4 or A5 diary for €2-€3 in Deals or one of the pound/euro shops. (2) establish routines and habits (no need to think about things any more, you just do it). (3) find a training buddy or friend, with whom you arrange to meet at least once or twice a week at a fixed day and time. This creates commitment and makes working out easier and more fun. Enjoy, let me know how you get on and send me an e-mail with questions you have in relation to these exercises. This entry was posted in Core Strength Videos, Fitness Exercise Videos and tagged Ball Plank, Ball Push-Up, Ball Roll-out, Core Strength Video, Exercise Videos, Gym Ball exercises, Pilates Ball exercises, Swiss Ball exercises, with Martin on October 15, 2016 by admini.